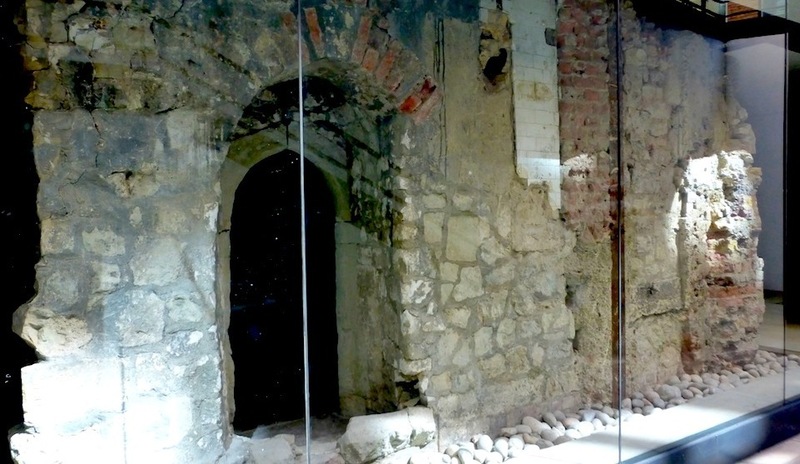 Whitefriars in London was a remarkably appropriate setting for a vital element of the Gothic Revival. It was in this area between Fleet Street and the Thames, where Carmelite friars once lived, that in 1834 a local wine-merchant called James Powell (1774-1840) bought up an already long-established glassworks. When his sons took over after their father's death, Arthur Powell (1812-94) opened a department for stained glass to meet what was now a growing demand. To this well-regarded workshop came the "barrister, archeologist and connoisseur of glass," Charles Winston (1814-64), bringing some samples of medieval glass which he wanted to have analysed (James Powell & Sons, 2). Winston was an opinionated man. Sir George Gilbert Scott, for example, felt that he could have achieved much more if he had been less abrasive: "The art of glass-painting has suffered a great loss from the crochets and ill-nature of a man who of all others was the best qualified to help it forward," Scott complained (219). Nevertheless Scott himself admitted that Winston, "in conjunction with Messrs. Powell of Whitefriars, effected very important improvements in the manufacture of glass for the purposes of glass-painting" (220). Chancel and east window of St James', Weybridge, by Powell & Sons (window designed by Charles Hardgrave, their chief designer then, and local artist Ada Currey). Perhaps he was too rigorous and unbending in his views, as Scott suggested, but James Powell & Sons' continuing connection with Winston meant that what was already "the only glass manufacturer to run a successful stained-glass operation in the early Victorian period" (Cheshire 48) went from strength to strength, producing windows of great beauty and historical authenticity, as well as the cheaper, mass-produced quarry glass for borders and backgrounds. Whitefriars was not the only centre of excellence. In 1838, William Wailes, too, had started out in this area of design, and he too soon began reviving the old methods. Stained-glass expert Jim Cheshire, writing in our own times, is at pains to see the revival of this art as a "vast collective effort" (175), to which, of course, A. W. N. Pugin and William Morris made major contributions. Nevertheless, the Whitefriars studio has fairly been described as "the leading firm of ornamental glass-makers throughout the century" (Sladen 82). This being the case, some of the most important names in the field were trained or worked there, or designed for the Powells, who evidently had a policy of involving artists of different kinds on a freelance basis. The firm's products "attracted the interest of the finest craftsmen of the day. Rossetti [a friend of Winston's] and Burne Jones were amongst those who then designed Stained Glass Windows for the Whitefriars Studios" (James Powell & Sons, 4). Others regularly mentioned in this context include Ford Madox Brown, James Doyle, Henry Holiday, William de Morgan, and Edward Poynter. Left: Silver-mounted glass centrepiece. Right: 1922 British Fair Advert, shortly before the works moved to Harrow, in Middlesex, in 1923, where they continued to operate until they closed down at the end of 1980. By kind permission of Grace's Guide, under the terms of the GNU Free Documentation License. When the founder's grandson, Harry James Powell (1853-1922), entered the studios in 1875, he opened up new areas for them. A graduate in classical moderations from Trinity College, Oxford, he had a special interest in chemistry, took a soundly scientific approach, and was eager to experiment. Producing "new colours from chemical processes and new techniques," he developed "heat resistant scientific glass, for use in laboratories and industry, and for the likes of x-ray tubes and early light bulbs" ("Whitefriars Glass"). He would be honoured for his contribution to the war effort, too: he made "glass for the projecting horns of marine mines" ("A Glassmaker's War Work"). This would seem to have little to do with more decorative design work. But the term "ornamental glass" covers more than stained glass; in fact it suggests something rather different. The firm had long been producing table glass: at William Morris's Red House, for example, the family "drank from plain, pale green glasses, made for the house by Powell of Whitefriars to Philip Webb's design" (Red House 16). This part of the enterprise continued to flourish, and indeed it "played a leading part"in the later Victorian trend away from cut glass towards capitalising on the "plastic qualities of glass" (Osborne 403). 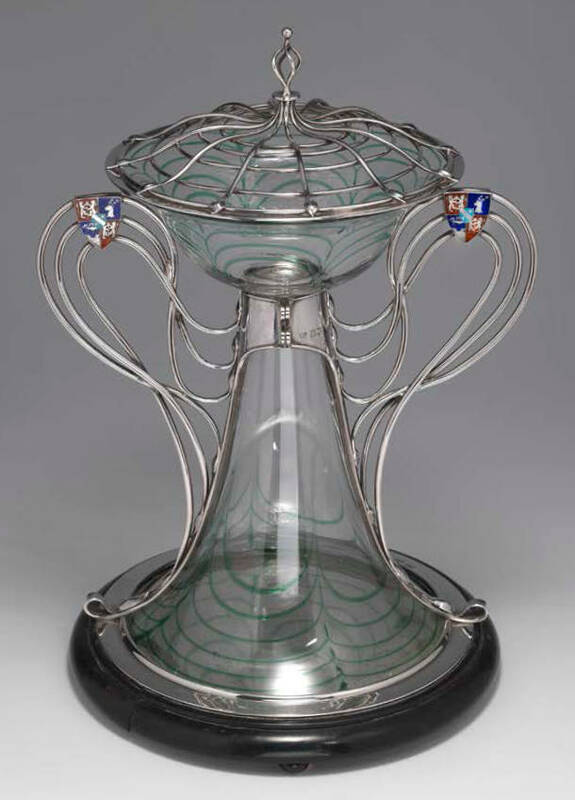 As one of the many disciples of Ruskin, and a member of the Art Workers' Guild and the Arts and Crafts Society which took over the guild's exhibition function, Harry both lectured on glass technology, and displayed the studios' wares, keeping the family products in the public eye. In particular, his "fascination with developing new forms of glass such as opalescent glass moved the company to new heights of late Victorian fashion" ("Whitefriars Glass"). 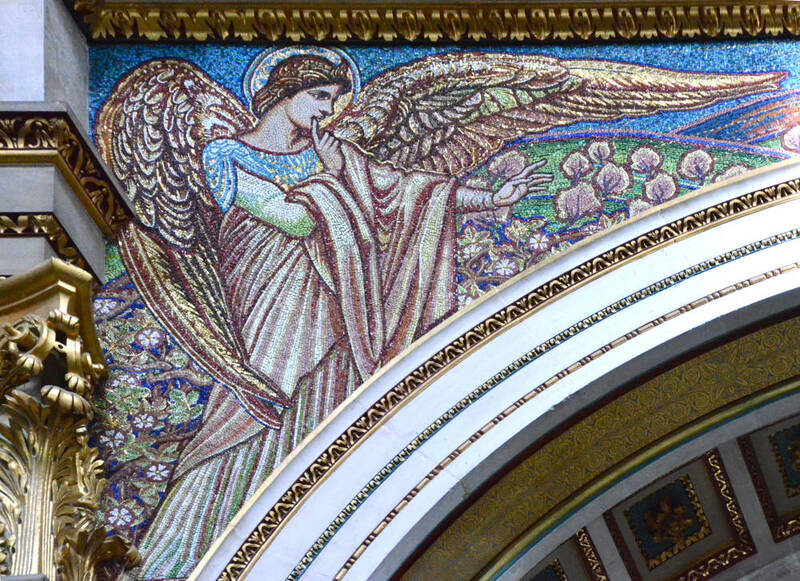 The Annunciating Angel in St Paul's, designed by Sir William Blake Richmond, produced by the Whitefriars studio. Thus it was that in the 1890s the Whitefriars Studio became well known for something slightly different: it provided the mosaics in St Paul's Cathedral, and for many other churches at the time of the Byzantine Revival. The work for St Paul's constituted a "great saga" which continued "in many instalments for many years," starting in August 1891 (see entry 255 in "Powell's Opus Sectile Locations"). These were to the designs of Sir William Blake Richmond. Various other artists designed the mosaics that they produced. 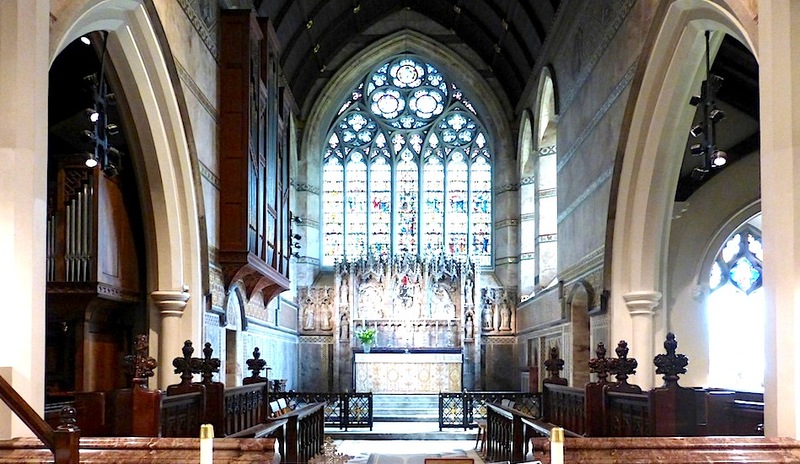 For example, at St James' Church, Weybridge, in Surrey, a local artist called Ada Currey (1852-1913) was involved in the design of the east window, and their records show that she received payments from them for cartooning work in a number of other churches. At St Mary, Kilburn, London, a note on a reredos ends with "Alteration by Miss Currey took 32 hours £135." This was in June 1902 (see entry 456 in "Powell's Opus Sectile Locations"). However, their chief "in-house" designer at this time was Charles Hardgrave (1848-1920), and he specialised in this kind of work. Hardgrave "frequently exhibited at the Royal Academy designs for mosaics and glass" (Knowles 45). Currey and Hardgrave's collaboration at St James' was clearly successful. Still, the influence of Burne-Jones, and the other artists on whose talents the firm had drawn, continued, and this ensured that "a Pre-Raphaelite strain of figure drawing persisted into the 1920s" ("James Powell & Sons") — something of which the firm had every reason to be proud. "Arthur Powell (1812-94)." Geni (Genealogy website). Web. 1 August 2014. "A Glassmaker's War Work" (obituary of Harry James Powell). The Times. 27 November 1922: 17. Times Digital Archive. 1 August 2014. James Powell & Sons. The Art of Stained Glass. Internet Archive. Uploaded by the Canadian Centre for Architecture. Web. 1 August 2014. "James Powell & Sons (1834-1980)." Stained Glass in Wales. Web. 1 August 2014. 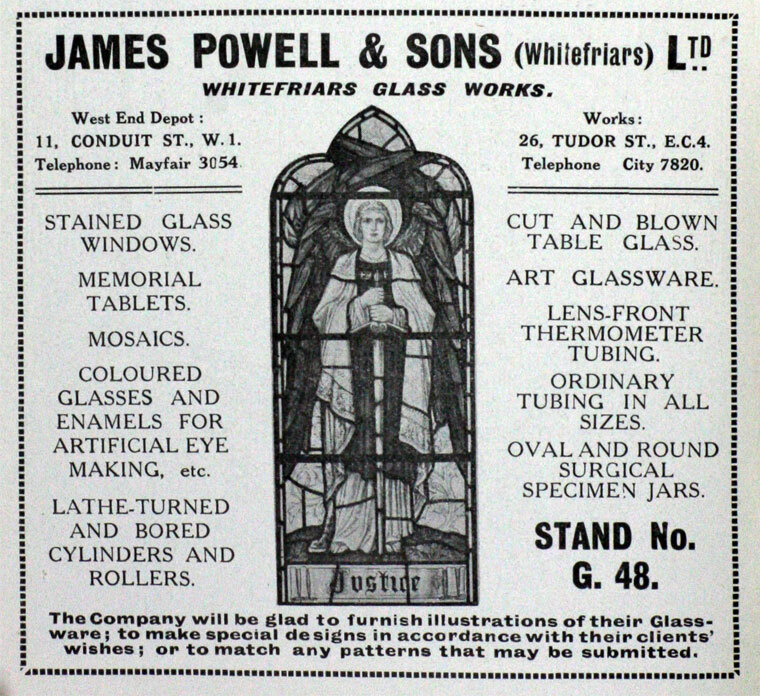 "James Powell and Sons (Whitefriars)." Grace's Guide: Industrial History. Web. 1 August 2014. Osborne, Harold, ed. Oxford Companion to the Decorative Arts. Oxford: Oxford University Press, 1975. "Powell’s Opus Sectile Locations." Compiled by Dennis Hadley. Tiles and Architectural Ceramics Society. Web. 1 August 2014. Red House: Bexley Heath. National Trust Guidebook. Rev. ed. Swindon: National Trust, 2004. Scott, G. Gilbert, ed. Personal and Professional Recollections of the Life of Sir George Gilbert Scott, R.A.. London: Sampson Low, Marston, Searle & and Rivington, 1879. Internet Archive. Uploaded by the University of Michigan. Web. 1 August 2014. "Whitefriars Glass: A Brief History (Part I)." Whitefriars.com (A Collectors' site). Web. 1 August 2014. Winston, Charles. An Inquiry into the Difference of Style Observable in Ancient Glass Paintings: Especially in England: With Hints on Glass Painting. Oxford: John Henry Parker, 1847. Internet Archive. Uploaded from the Research Library, the Getty Research Institute. Web. 1 August 2014.